Summon your morpho minion. 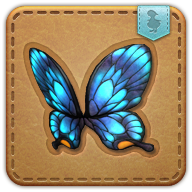 With blue wings practically glowing, this butterfly feels almost like a spirit. Almost. The wings of this butterfly were highly sought after during the War of the Magi, as their scales could be used to make poison that inhibited the restoration of magical energy. As a result, they were hunted to near extinction, and now very few remain. Delivers 10 points of damage every second to all enemies within range.